8 games of Laser Tag at Laser Storm for just $24.99! You don’t just play the game… You are the game!!!! 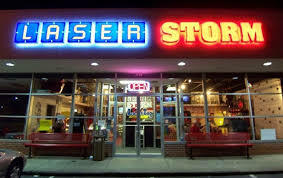 Established in 1996, Laser Storm is a family entertainment center complete with an arcade and a large laser tag arena. There is loud, heart pumping music as the red laser beam cuts through the fog surrounding you. You know your opponent is near, turning around, you see him near the team’s base station that you’re trying to protect. Suddenly in the black light, fog enshrouded arena a police beacon flashes across your opponent. You seize the opportunity, aim and fire! Seeing his sensors flash red and green, you know that you have just brought your team one point closer to victory!! Laser Storm is a unique, interactive laser tag adventure that puts players right into the heat of the action. After a brief introduction, each team puts on lightweight vests and headsets then enter a futuristic arena with phaser in hand, ready to seek, find and deactivate opposing team members and their base station for points. The arena consists of barriers, police beacons, energizers, base stations, sentries and more. The object is to out score the other team. Points are awarded for tagging the opponents base station and by deactivating other players. At the end of the game each player will be given a personalized score card showing their performance. Score card information includes shots fired, accuracy, team MVPs and much more! Learn about us by playing Laser Storm! Voucher is good for 8 games of laser storm laser tag that can be shared between 2 to 8 players. Voucher cannot be used towards a birthday party, group outing or any service that can be booked online. Only one deal voucher can be used per visit.